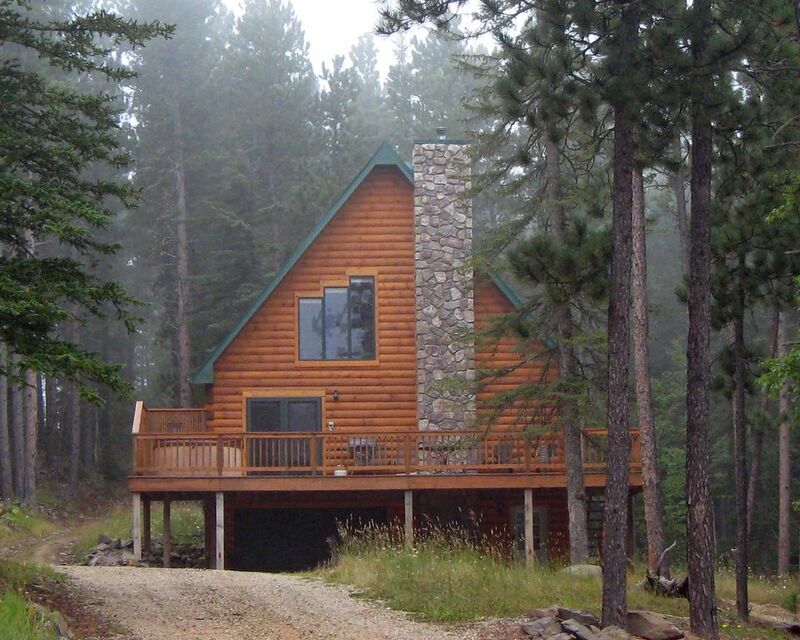 This beautifully decorated lodge is nestled on a 1 acre lot among the ponderosa pines and quaking aspens on Deer Mountain-Black Hills, in Lead, South Dakota. We are 1 hour from Rapid City, 10 min. to Lead/Deadwood and 20 minutes from Sturgis. We've taken great pride in furnishing this log home, so you'll feel right at 'home'. Whether you're sitting in the hot tub on the front deck or just taking in the beauty and wildlife from the 2nd floor rear balcony, you'll be sure to enjoy the fresh mountain air and blue skies. On a clear night, the stars will light your way, or you can relax in front of the fireplace on a chilly night with that special someone. We have highspeed wireless internet so bring your laptop! Taking a family vacation? Visit Mount Rushmore National Monument. An annual hunting trip? Deer,elk or wild turkey. Skiing? Deer Mountain or Terry Peak Snowmobiling? Right from the cabin. Hiking or biking? Mickelson trail. Much more! Amenities: Hot tub, patio table & chairs and gas grill on oversized main floor deck; fireplace on main level; full baths on each floor; picnic table underneath front deck. Master bedroom has a king size bed, dresser and loveseat. French doors will lead you to a 2nd story balcony that has a table for 2 for enjoying your morning coffee. Other bedrooms have queen size beds, dressers and chair or chairs. Loft has a queen size sleeper sofa, chair and loveseat. There is also a twin roll-a-way bed available. Living room has a sofa, and three chairs. There is a gas fireplace to warm up the chilly nights! The ground floor bedroom features a single over full bunk bed, a full bath, and an efficiency kitchen with microwave. This entry level floor also has a family room with a sofa sleeper and a Wii game system for the kids or the kid in you! We have ceiling fans throughout, basic satellite TV, Blu Ray player, fully equipped kitchen with refrigerator, dishwasher, garbage disposal, electric range, microwave hood, small appliances including a Belgian waffle maker, cooking and eating utensils. WiFi is available, so don't forget your laptop! Linens, blankets, and towels are all furnished. Washer and dryer are located on the ground floor. Off street/road parking with dual access for easy trailer movability. Activities: There's plenty to see and do. Mt. Rushmore, Custer State Park (Needles Highway and Iron Mtn Road), Spearfish Canyon, Historic Deadwood, Devil's Tower-WY, Spearfish, Sturgis, Rapid City are all within an hours drive. For the outdoor people, there's wildlife viewing, hiking, hunting, horseback riding, fishing, golf, biking, ATV rental, skiing of all kinds and snowmobiling in the winter months. There are also museums to visit, gambling and don't forget shopping! The bathroom in the upper level is accessible from both the loft and the master bedroom. Plenty of off road parking to accommodate trailers. Just minutes away from historic Deadwood. Wi-fi available....bring your laptop!! Nintendo Wii game system and games. Garage is an over-sized single and is heated. There is a large parking area in front of the home, room for several vehicles. Master bedroom features French doors opening to a private deck that faces the back of the property. Nice cabin and very “homey”! Enjoyed the two night stay with family, celebrating family Christmas! Only complaints were that the hot tub towels were limited, hideaway beds were uncomfortable and no dishwaher detergent...bought some for our stay. Would recommend this cabin to others! We’re glad to hear you enjoyed the cabin! We love it too! Thanks for the comments on how we can improve. We view all comments as opportunities to make Towering Pines Lodge the best it can be! This home exceeded our expectations. Very clean, great surroundings, we were joined by our friends to celebrate our 45 wedding anniversary and we all loved our time there. This home made everyone feel comfortable and relaxed. Saw wildlife off the deck which was very nice. We highly recommend this home. This house worked out well for the 10 of us. We were just the right distance for a nice ride to get to all of our destinations. Beautiful cabin, beautiful view, and wonderfully priced. Super clean and super homey. So close to many fun activities. Such wonderful owners, had to contact them early one morning and they replied back immediately. We had a great time staying at this property over the Memorial weekend. Close to the trail heads and lots of room and amenities were enjoyed by my family. Beautiful setting in the woods and a great place to unwind after a long day on the trails in and around the Deadwood area. We loved this place! We spent a 4 generation Christmas holiday here. We had everything we needed and did not feel crowded or cramped. Nicely appointed, owners were more than accommodating! Easy winter access. We highly recommend it. We are located in the northern Black Hills, just 15 minutes from historic Deadwood. Terry Peak and Mystic Mountain ski lodges are both within a couple of miles. Beautiful Spearfish Canyon is only minutes away. Holidays require 3 night minimum stay. Sturgis Rally Rate $650/night. Rates subject to change without notice. Deposit of $300 ($500 for rally rental) is required to guarantee reservation and is security against damage, late checkout, and other reasons as described in rental agreement. The vacation home will be inspected after you check out and deposit will be returned if no damage is found. Rental agreement sent upon request. Must be 21 to reserve/rent property.